The computerization of the medication circuit and the patient file is the major challenge for each structure. 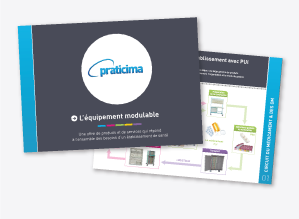 Praticima, major actor in the medicine circuit and the care equipment can follow you in your computerization development projects. We propose you a global offer for the informatized patient file trolleys for Doctors and for the informatized care and medicine trolleys for nurses. Our aim is to help you in adapting every kind of informatics materials. Beyond the trolleys, we propose you autonomy systems and medical informatics materials (keypad, mousepad, Panel Pc…); it means for you a single interlocutor for your project.